The code is in the Pulsar directory of my ChaosTestingCode repo on Github. The clients communicate to the brokers via a proxy. In each test we’ll send messages and perform some kind of chaos action, such as killing the topic owner Pulsar broker, killing a bookie that is a member of the current ledger ensemble, isolating nodes from ZooKeeper etc. Once publishing is complete, we start up a reader and count the messages and ensure that all acknowledged message were received, and that they are read in the correct order. Feel free to skip to the end where I summarize the results. If you care about the test method, then read on. All tests are run with a producer sending messages as fast as it can, which with my setup is about 20000-30000 a second. Some tests take longer, so I increase the total number of messages to send, rather than slow down the producer. message marker of when to kick-off the chaos action. 50000 for example, means on receiving the 50000th ack, perform the chaos action. It usually takes time to kick in so the action may take place a few hundred thousand messages later. Various blockade.yml files are stored in the cluster/blockade-files directory. Each one has a different number of brokers and bookies. Before calling “blockade up”, the correct file is copied to the cluster directory. Start publishing messages. The contents of each message is a monotonically increasing integer. This is used in the ordering check. All output is displayed in the terminal. A more concise output is logged to: [test-name]-output.txt in the automated/test-output directory. Details of duplicates and out-of-order messages are logged to [test-name]-duplicates.txt and [test-name]-out-of-order.txt. When a message is sent, we add its integer value to a dictionary “messages_sent” as the key and an empty list as the value. When a message is positively acked we add the integer value to the set “messages_pos_acked”. When a message is negatively acked we add the integer value to the set “messages_neg_acked”. Acked messages missing = Any keys in the “messages_sent” dictionary with an empty message id list and that exists in the pos acked set. Non-acked messages received = Any keys in the “messages_sent” dictionary with a non-empty message id list and that does not exist in the pos acked set. Note that the producer will only allow up to 10000 messages in flight at a time. Once the acks are lagging 10000 behind the sending, it pauses itself to wait for acks to catch up a little. We’ll see the number 10000 in some of the tests for this reason. Finally, regarding duplicates. The Pulsar client will automatically retry messages on failure up to the send timeout. This means that duplicates can be created when a message successfully gets written to BookKeeper but the Pulsar broker dies or fails before it can send an ack to the client. Unless explicitly specified, the deduplication feature is off on all tests. I experienced strange behaviour where readers and consumers could not consume a topic after killing off bookies. It ended up being related to the default E, Qw and Qa settings. The cursors are stored in ledgers created by the above default values and if there are not enough bookies to satisfy those numbers then the subscriptions cannot be created. In the above configuration you’ll need at least 4 bookies to make your cluster work. So when testing with smaller numbers of bookies you’ll need to make sure that those numbers match the lowest number of bookies that your scenario will use (taking into account any bookie failures also). All the scenarios use the defaults of 2, 2, 2 and I always have at a minimum 3 bookies, so that we ensure we don’t lose cursor data when killing one bookie and that we can create new readers and consumers. Our first scenario will simply publish 2,000,000 messages without performing any chaos actions and checking that all messages are read, and that those messages are read in the right order without duplication. The test is run 5 times. Below I include the terminal output to give an idea of what it does. I have omitted the test output of all but the last run for brevity. As you can see, it’s not fast. It took 20 minutes to run the five tests. The main issue is that creating this blockade cluster is pretty slow. With RabbitMQ and Kafka it was pretty quick, but this Pulsar cluster is really CPU intensive and slow to start up. Part of that might be that we are normally running 8 nodes (1 ZK, 1 Proxy, 3 Brokers and 3 Bookies) but sometimes up to 11. Also see that no message loss occurred with no duplication or ordering issues. In this test, the pulsar-test.py uses some shell scripts to detect which broker is the owner and kills it during message transmission. This scenario has the minimum redundancy possible with E=2, Qw=2 and Qa=1 with 3 pulsar brokers and 3 bookies. This means we have two copies of each message but only an ack from a single bookie is required for the broker to send an ack to the client. We kill a broker during message transmission which should not cause any data loss. Messages are only acked once persisted to disk by Qa bookies and the broker itself sends the ack. If we kill a broker, at worst we might see unacknowledged messages being read by the reader. A message may be persisted by BK but the Pulsar broker dies before being able to send the ack to the client. When a new broker takes over, the recovery process will detect those messages and ensure they are replicated before closing that ledger, making them available to readers. I have included the full output of one run to give you an idea of when the script performs each action. Each test run sends 1,000,000 messages, starting the process of killing the owner at message 50000. The test is performed 5 times. pulsar2 is the topic owner, killing pulsar2!!!!!! We see that midway through sending the messages, pulsar2 is identified as the owner and shortly after is killed. The client experiences a connection failure and reconnects, via the proxy, to pulsar1 which is the new owner. It then commences the sending of its messages. 10000 messages are negatively acknowledged (timeouts) because there are usually 10000 messages in flight due to the messages in flight limit the producer adheres to. That leaves 990000 acknowledged messages, all of which were read, in the correct order without any duplicates. No message loss. Run 3 saw 1065 unacknowledged messages get read in one run. This is expected and not a problem unless duplication caused by retries is an issue. The deduplication feature when enabled should avoid that, we’ll test that too later on. As predicted, broker fail-over produces no message loss. Again, we will test the resiliency of Pulsar with the minimum redundancy configuration of 2-2-1 with 3 brokers and 3 bookies. Midway through sending 1,000,000 messages, a bookie in the current ledger ensemble will be identified and killed. Then we’ll check if the reader reads all 1,000,000 messages in the right order. I cheat a little and assume that the current ledger is the first ledger. I have performed many many tests and at least the first million messages in my tests end up in entries on the first ledger. So we simply target the ensemble for the first ledger which has a known path in ZooKeeper. We shouldn’t see any message loss as we only kill one bookie and we have a Qw of 2. If the bookie that acks a message gets killed then we have only 1 copy of that entry until AutoRecovery can rereplicate it, but we’d have to lose both to lose the data. There is no split-brain because the bookies are followers. I show the full output of a single run, then show the results of 5 test runs. bookie1 is in the current ledger ensemble, killing bookie1!!!!!! We saw that midway through sending, bookie1 got killed. Message transmission carried on unhampered and the reader was able to read all 1,000,000 messages in the correct order without duplication. No message loss, no duplicates, no ordering issues. In this test we’ll isolate the topic owner broker from ZooKeeper, but not from anything else. The predicted behaviour is that the broker should receive writes until it realizes that it cannot see ZK, at which point it will restart itself. A different broker should then take over. We should see similar behaviour to that of killing the node. pulsar1 is the topic owner, isolating pulsar1 from zookeepr!!!!!! In this scenario we sent 2,000,000 messages as it takes a while to isolate the owner broker and for that change to have an impact. At about the 1.4M message mark the fail-over occured and the reconnection happened quickly. The reader read all 2,000,000 messages in the right order without duplication. No message loss or ordering issues, but this time we have seen some message duplication. On two test runs 1000 and 1090 messages were duplicated. When the reader sees that the integer value of a message is lower or equal to the previously read message and this value has been previously read (meaning it is a dup), it logs the message id and integer value of the previously consumed message and of the current message to the [test-name]-duplicates.txt file. There is one entry for run 3, indicating that the duplications were in one contiguous block of messages. The integer value of 1,355,635 was found a second time at message id (1,0,0,-1) which is first message in ledger 1, entry 0. It seems that 1000 messages were written at the end of ledger 0 and then those same 1000 messages were written again at the beginning of the next ledger. The same is true for two contiguous blocks of duplicates in run 4. The duplications could have been caused by the client resending messages after the first broker restarted itself. 1000 messages get sent to pulsar1, it sends them to a BK ensemble, but before it acks the client it shutsdown because it has lost ZooKeeper connectivity. The client then reconnects, now to pulsar2, the new owner, and sends the 1000 messages again. Pulsar2 recovered the last ledger, owned by pulsar1, closed it and then opened a new ledger, ready to accept new messages. It received the 1000 messages from the client and wrote them to its new ledger. That would explain what we see in the duplicates log. We can test that by enabling the deduplication feature. When enabled, a broker stores the last sequence number of each producer in a hashtable. When it receives a lower sequence number it knows that it is a duplicate and ignores it. It stores the (producer, sequence number) per topic data in a cursor so that, in a broker fail-over, the new broker can recreate the hashtable. The hashtable is snapshotted periodically so in the event of a broker failure, the latest sequence numbers in the hashtable might be lost. This would create a window of opportunity for duplication in the event of a broker fail-over if the new broker only relied on that snapshot. To avoid that scenario the new Pulsar owner reads the last N entries from the ledger and adds them to the hashtable, thereby covering any gap induced by the fail-over. Configuration 2-2-1 3-3 with deduplication. Exactly the same test as scenario 3 except that we’ll enable the deduplication feature and see if this prevents the deduplication. I enable the deduplication feature by adding brokerDeduplicationEnabled to the environment section of each broker in the blockade.yml. That seems to have solved the duplication issue caused in scenario 3. Bookies do not require ZooKeeper for reads and writes, only for registering themselves with ZK, garbage collection and AutoRecovery. This I need to confirm. So accordingly, isolating a bookie from ZooKeeper should have no affect. Let’s see. No message loss, no duplication, ordering ok. This scenario is the same as scenario 2 except we have redundancy of 3 and kill off 2 bookies. Pulsar tolerates up to Qw-1 bookie failures without message loss. We can use the “kill-bookies[n]” command to kill an arbitrary number of bookies in the current ensemble. Notice that we got over 5000 duplicates in one test run. I inspected the full output of that run and see a type of connection error regarding a bad producer id. This requires further investigation, it may or may not be linked to the bookie failures. Either way, it only caused duplication and that could have been avoided by activating the deduplication feature. But still no message loss or ordering issues. What happens if we kill Qw bookies though? That is an unfair test as we would be destroying all the replicated data. Still, let’s run it to confirm the behaviour. In this scenario we kill both bookies that make up the ensemble of the current ledger. Notice that the sending of messages went on, unhindered. When both bookies failed, the broker will have created a new fragment with a new ensemble. There were originally 5 bookies, leaving 3 available to host the new fragment with E and Qw of 2. However the reader blocks on read_next() as it is trying to read from a fragment that we no longer have the data for (unless the killed bookies come back with their data intact). We can inspect in ZooKeeper, which ledgers are underreplicated. I have a bash script that monitors the underreplication path. The first fragment, that our reader is blocking on, has bookies with IP addresses 172.20.0.3 and 172.20.0.5 which correspond to the two bookies we killed. The ledger cannot be recovered because the data of the first fragment is gone. If the data on those two bookies is gone forever all we could do is skip to entry id 949 to continue reading. But if we could bring back just one of those two bookies, then AutoRecovery could ensure that the fragment gets fully replicated and is available again. 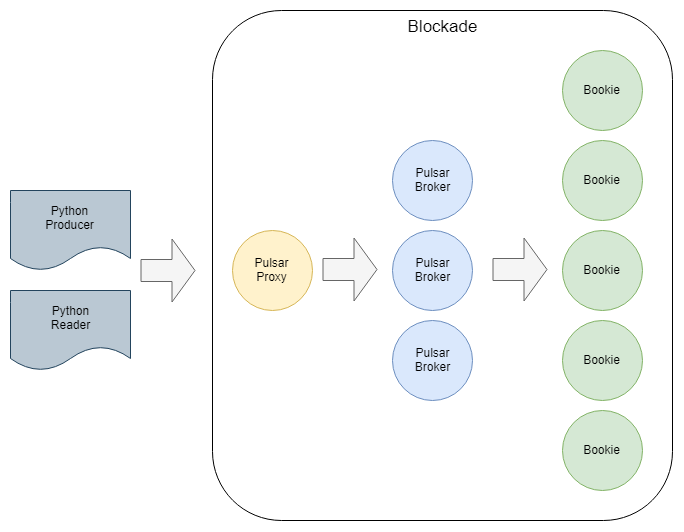 Let’s simulate that by starting bookie1 using the command “blockade start bookie1” from the cluster directory. The first thing we notice is that the reader jumps into life and consumes 650,000 messages, then blocks and finally it reaches the 60 second timeout I gave it and the test run ends. Notice that the last entry it read from before giving up was 946, just three away from the beginning of the second fragment. It got stuck at the end of the first fragment, but why? UPDATE: I have updated this section from the original after feedback from Ivan Kelly. Well, with a Qa of 1, when we killed both bookies of the ensemble, the last three entries only got persisted to a single bookie. That bookie is still down, so those last three entries are not readable. I use the reader.py script to consume from that topic. It also blocks at the 650,000 message mark. Now I start bookie 3: blockade start bookie3. The reader.py then gets past the point, slow at first then rapidly consumes the 2,000,000 messages. This is due to the fact that exponential back-off is applied to reads, then when reading resumes after previous read failures, it does a TCP like slow start where it gradually increases the batch sizes it reads from bookies. I inspect the underreplication path in ZooKeeper and ledger 0000 no longer appears. In theory, now that the ledger is fully replicated, I could kill bookie3 again, and because bookie1 now will have all the entries of the first fragment, AutoRecovery should kick-in and rereplicate the ledger to a second bookie. Each  meanings that no ledgers are underreplicated. It takes about 2 seconds to inspect the underreplication path (exec to docker, run zookeeper-shell etc). So it took about 16 seconds to detect that ledger 0000 was underreplicated. But then just 8 seconds to perform rereplication. bookie3 (172.20.0.5) is no longer a member of the ensemble for the first fragment. AutoRecovery has done its job. That you can only lose up to Qw-1 bookies. If you lose Qw bookies then you really want to bring those bookies back online with their data intact. In that case then you will not have lost data. Auto Recovery also cannot repair an under-replicated ledger where the number of lost bookies of its ensemble is equal to its ack quorum (Qa). So with Qa=1 and a single lost bookie, AutoRecovery will not be able to repair the ledger. Regarding this inability for BookKeeper to recover a ledger in this situation, Ivan Kelly helped out by commenting that: “Its the close operation that is failing. Close need to decide what the last entry of the segment is. With Qa=1, this is not possible if 1 bookie of the write quorum is down, as that bookie could have acknowledged a write (or could yet acknowledge a write if we're being strict)”. So Qa=1 is a dangerous configuration choice as all you need is a single downed bookie and an under-replicated ledger cannot be repaired. None of the tests were able to produce message loss. None of the tests were able to produce ordering issues. I am ignoring the killing Qw bookies test, though once we brought back both bookies we were able to consume all the messages. Today we’ve seen that both killing a broker and isolating a broker from ZooKeeper cannot cause message loss but can cause non-acknowledged messages to be read (which is normal and unavoidable) and can cause duplication if the deduplication feature is not enabled. We have seen that duplication works, even in a fail-over situation. I will be testing deduplication further in the next part. Killing a single bookie also cannot produce message loss with a Qw of 2 or more. Isolating a bookie from ZooKeeper also has no affect. We saw that losing all the bookies of an ensemble will block readers until those bookies come back. If they don’t come back then your data is gone. But we can’t expect anything else when we lose all copies of the data. Write Quorum (Qw). You need at least Qw of at least 2 to survive the loss of a bookie. Ack Quorum (Qa). You need a Qa of at least 2 for AutoRecovery to be able to rereplicate a ledger after the loss of a bookie. You need at least Default E bookies available in order to create readers and consumers as their cursors use that value for their cursors. All in all, Apache Pulsar is looking very robust so far and hard to misconfigure. I have found a couple of little things that warrant further investigation, such as producers slowing down significantly after a broker fail-over, if the number of messages in flight at the time was close to the internal pending message queue size. But regarding the claims of zero message loss and ordering guarantees, Apache Pulsar has come out flawless. Long-running test (a few hours) with slow producers, randomly killing a node (broker or bookie every 5 minutes). Check for message loss and ordering issues. Send a load of messages. Then over a period of hours, kill a random bookie every 5-10 minutes. Check at the end if AutoRecovery has managed to maintain full replication without message loss.